BERKS CEMETERY EXTENSION is separated from Hyde Park Corner Cemetery by a road. The extension was begun in June 1916 and used continuously until September 1917. At the Armistice, the extension comprised Plot I only, but Plots II and III were added in 1930 when graves were brought in from Rosenberg Chateau Military Cemetery and Extension, about 1 kilometre to the north-west, when it was established that these sites could not be acquired in perpetuity. Rosenberg Chateau Military Cemetery was used by fighting units from November 1914 to August 1916. The extension was begun in May 1916 and used until March 1918. Together, the cemetery and extension were sometimes referred to as 'Red Lodge'. 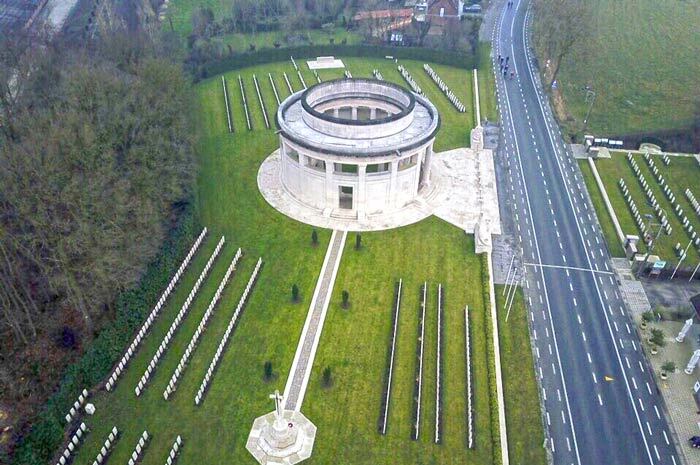 Berks Cemetery Extension now contains 876 First World War burials. The cemetery, cemetery extension and memorial were designed by H Chalton Bradshaw.